LA shoppers are getting some help with holiday shopping -- the City of LA is deploying white-gloved traffic officers to help keep traffic moving around some of our busiest shopping centers. 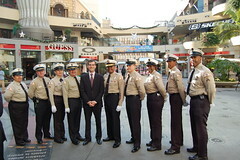 Mayor Villaraigosa, Councilmember Wendy Greuel and I made the announcement at Hollywood and Highland this morning. Of course, it's always great to take public transit. The Metro site can be helpful with planning routes.